"ONE WHITE ROSE FOR DEATH"
In October of 1986, Jessica Fletcher attended a concert recital in Washington, DC, which led to political defections and, of course, to murder. The Prime Minister of Great Britain was also in attendance at the concert but was never seen nor mentioned by name. Here are the snippets of dialogue from the episode which concerned the Prime Minister. Jessica Fletcher: Well, it won't be much of a stay, but when Geoffrey told me about my invitation to the party tonight, I couldn't resist. Jessica: Followed by a reception at the estate of Senator Constable with none other than the Prime Minister as the guest of honor. First Secretary: After that assassination attempt in Australia last week, most of our security is elsewhere this evening protecting the Prime Minister. First Secretary: I am operating under the direct orders of the Ambassador who will be here shortly as soon as he is certain the Prime Minister is secure for the evening. Andrew: I'm going to have a word with the Ambassador about him. Well, it's after 2:00. Should've returned by now. Jessica: He's on his way, Andrew. First Secretary: They just put the prime minister on a plane back to England. Andrew: Did they? Well, I thought the P.M. wasn't supposed to leave until Tuesday. Here are some examples that Thatcher did exist as the P.M. in the main Toobworld. "'The Muppet Movie'", *love* that film. Margaret Thatcher, urgh." "You're going to tell me next you voted for Margaret Thatcher." "Margaret Thatcher wasn't creepy. OK - well, maybe a little. In fact, she was like an aunt of mine - same hairstyle, facial structure, only my aunt was much taller, and remarkably hirsute. Oddest thing: she had to shave twice a day." Tom: "Oh, for goodness sake, he was also the man who said that Margaret Thatcher would be prime minister!" Diana: "Margaret Thatcher *was* prime minister." Episode: A New Dawn (1990)"A teensy bit? This bear's visited more disaster scenes than Margaret Thatcher." 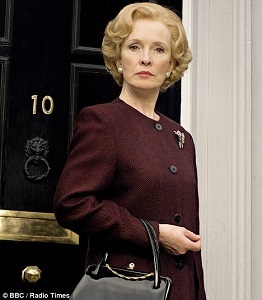 Mrs. Thatcher was portrayed on TV countless times and we could almost invariably accept any one of those actresses to have been the P.M. had she appeared in the episode. In the end, it doesn't really matter as historical figures are given a pass in the main Toobworld as to the differences in their appearances due to recasting. We at Toobworld Central chalk it up to the point of view perspectives of the fictional characters who observe them. 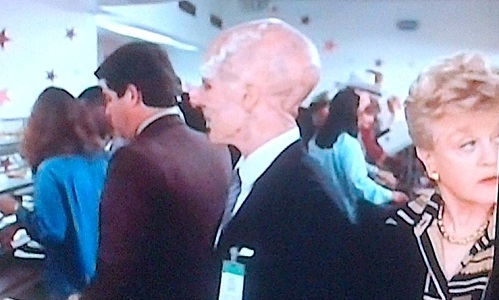 "Alien Nation" as a movie debuted in 1988. 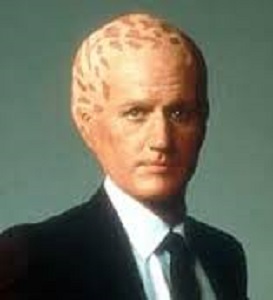 'Alien Nation' as a TV series premiered the next year. But the events within the reality of the TV Universe did not begin until 1991, when the space ship filled with rebellious Tenctonese slaves crashed in the desert outside of Los Angeles. The series jumps ahead to about 1995 when the Newcomers (disparagingly called "Slags" and "Spongeheads" by haters) were somewhat integrated into society at large in L.A. 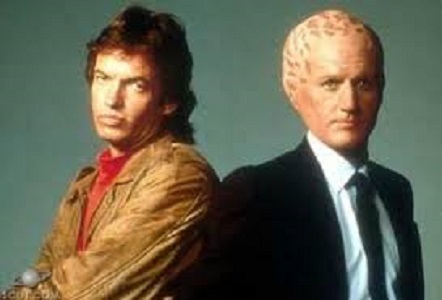 Despite the huge impact that the series would have had on Toobworld in general (but specifically on TV shows set in Los Angeles - like the ABC 'Columbo' after 1989, for example), I believe 'Alien Nation' can be part of Earth Prime-Time. As to why we don't see them in the main Toobworld anymore? I splained that away at some point in the blog with most of the Tenctonese relocated to an uninhabited planet, thanks to the Doctor and his bigger on the inside TARDIS. Lisa tells Brian Watkins that "Alien Nation" was her favourite television series. Willow is called this after she shaves her head. That second one is considered by the IMDb to be a reference to the movie. Not that it matters for the Toobworld Dynamic. The 1988 movie exists as reality in the Cineverse, but for Earth Prime-Time it was a movie made about the "real life" events. As for the 'Saved By The Bell' reference to a TV show... again, that could have been made within the TV Universe to depict what happened when the Tenctonese arrived and how they adapted to life among the humans. As an alien, the actor was not an exact match for a Tenctonese. There could have been a very good reason for that - although as a news story in the public domain the Tenctonese could have been given a fictional treatment as they were, the producers of this TV show might have altered their appearance, perhaps even changed their alien race's name, so that they could focus on a particular Tenctonese individual's story. And that Newcomer was probably LAPD homicide detective George Francisco. 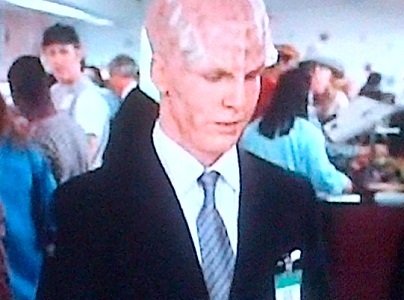 As we can see, the actor playing the alien is in full makeup. He would never have been allowed to get that far had he not already been in costume. So that black suit must be the costume. Doesn't he look as though he was an alien police detective? 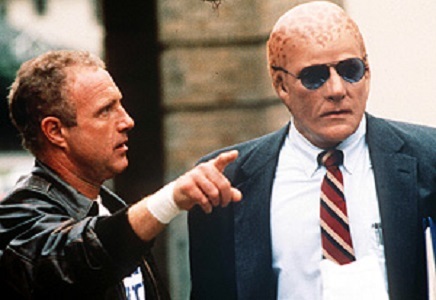 So in Toobworld, the 'Alien Nation' TV show was based on the actual Tenctonese, and apparently ran longer than the series did in the real world, which was off the air by May of 1990. But that's supposition based on the 'Saved By The Bell' quote happening in 1991. I watched this show every episode last season, but I don't think it was ever established when the timeline for that dimension began. 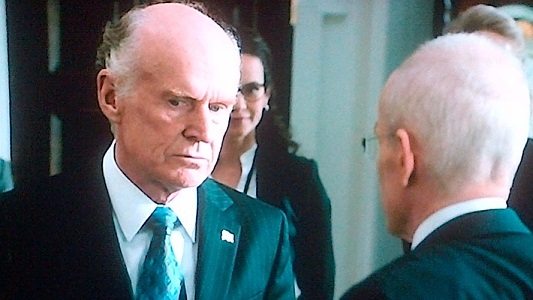 In the second season premiere, we learned from the addled President Pro Tempore of the Senate Theodore Gates that both Gerald Ford and Ronald Reagan had been the POTUS in that world. So when did the diversion begin? In "Back To The Future Part II", Marty McFly travels to October 21, 2015 and a good portion of the movie takes place during that time. But it must have lasted long enough for Hollywood to become aware of it, or perhaps like Cisco in 'The Flash, somebody had memories of that alternate timeline and decided to make those visions into a movie. And in the revised timeline of Toobworld, "Back To The Future II" as a movie was seen by plenty of TV characters. And the take-away for most of those characters? For the most part, hoverboards. Friendly Fire invites the Tick and Arthur to a film festival of all three "Back to the Future" movies. Sheldon has a nightmare about Leonard mixing up his "Back to the Future" Parts II and III DVDs and cases. Justin: If I was a slacker, would I know how to recalibrate a flux capacitor? Ryan: That's from "Back to the Future", it was on last night! Mike says that he knows the world is not going to end in 2012 because Marty McFly time traveled to the year 2015. "He's using the Biff strategy!" Abed has a Back to the Future Part II poster on his dorm room wall. 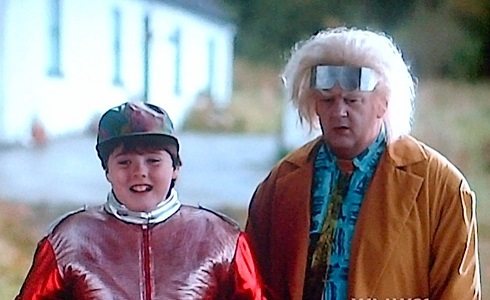 Mentioned by the narrator, Adam has a Back to the Future Part II movie poster on his bedroom wall, and the plot revolves around Adam saying that he broke his arm whilst riding a hoverboard. Ali asks someone if they've seen this movie when talking about hover-boards. The second shot of the episode includes a sign that reads "Hover boarding prohibited". 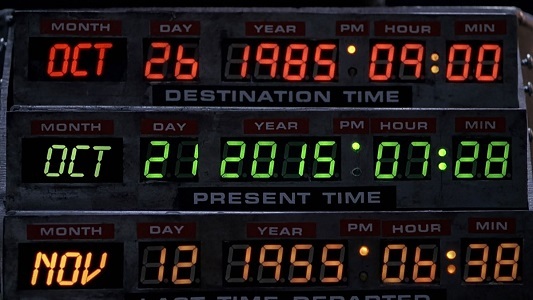 Shawn asks, "Where is the hoverboard technology that we all saw in 'Back to the Future II' over 20 years ago?" Sheldon makes a reference to the hoverboard. Jessie tells Ava that she wants to have children in the future, the distant future, one with hoverboards. "This makes 'Back to the Future II' look like the 'Terminator' series." Kenzi says to Bruce "Roads. Where we're going, we don't need roads." Padraig and Crunchie Haystacks dress in Marty McFly and Doc Brown's outfits from the film. I don't know if any Spanish language drama series can be considered a tele-novela, but another one has been bought by an American production company to be adapted for the English-speaking audience of the United States. The show is titled 'Personal Motives' and is based on the 2005 series 'Motivos Personales'. That series is from the same company which also produced 'Los Misterios de Laura' and I would hope you can recognize that title to have been adapted into NBC's 'The Mysteries Of Laura'. 'Grey's Anatomy' actress Ellen Pompeo's production company "Calamity Jane" will make the adaptation, which will about a news anchor who is in the middle of her broadcast when she sees her husband live on the screen being arrested for murder. She then sets out to prove her husband innocent. As for the other route it could take, the most recent series that could serve as an example would be 'Broadchurch', which was adapted by FOX as 'Gracepoint'. There, the shocking revelation at the end of that mini-series started out as the same as in the original, with a lot of the same plot points along the way. But then, 'Gracepoint' kept going and provided a new twist to the solution of the case. I was glad for it, but I think it would have made for a more gripping conclusion if only the showrunners and the network that it should be a one-season and done series. Then they could have provided a shocking finale along the lines of Ira Levin's play and TV movie "Dr. Cook's Garden". Since it's all up in the air for the time being, I've wasted too many key strokes on this story as it is. But I will end with this: I think the likelihood is good for both versions of this series to exist in Earth Prime-Time - the original in Tel-España and the other in Telemerica. The Sainte-Marie Heritage Society is celebrating the island's history with a traditional dinner but the members all end up with food poisoning and in the case of group president Francis Davison it is fatal. Suspects number Francis's teen-aged son Ryan, who argued with his father, club secretary Teresa Gower, who was embezzling funds, Francis's ex-mistress Inke and ex-military man Alan Burke, who left the group after a disagreement with Francis. Goodman must determine who is the killer whilst trying to fight his feelings for Camille. "THE ADVENTURE OF CAESAR'S LAST SLEEP"
Mobster Ralph Caesar survives a bombing attempt and plays dead, hiding out in a hotel room with two police guards. But he is found dead anyway, of poison. Furious crusading District Attorney Erwin Murphy accuses Inspector Queen and the two guards (including Velie) of serving poisoned chewing gum, the only thing the mobster had to dine on. Ellery thinks this unlikely because nobody opened the packet except Caeser, and starts looking for other ways the poison could have been administered. That's a great song, but not necessarily one that comes to mind as an option for a wedding song. 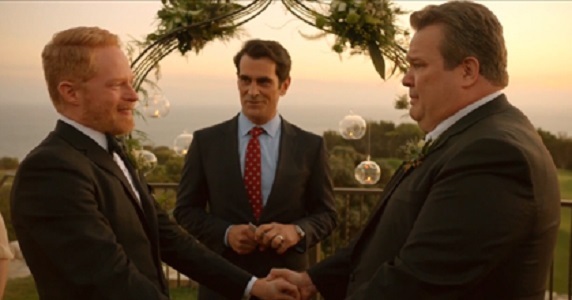 But it's what was playing in the background when Cameron Tucker and Mitchell Pritchard exchanged vows at their ceremony. Thanks to my brother Bill for noticing it as being a cover.